Protect your vehicle and more importantly you. TJM Bull Bars provide unparalleled vehicle protection with a comprehensive range of steel and alloy options individually designed to complement the shape of your vehicle. Virtually tested to determine peak loads and identify critical points of strength and remove weakness. 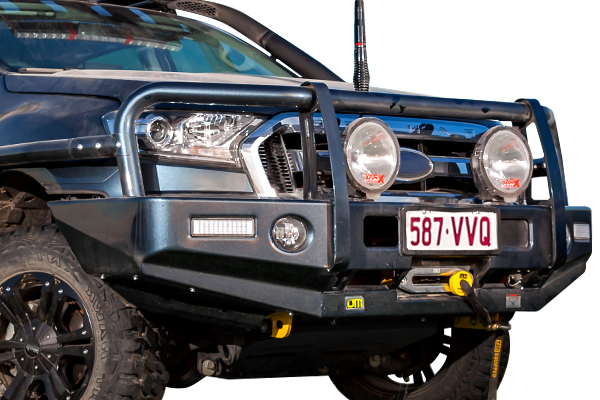 Equipped with mounting points for winches, driving lights, communication aerials and rated recovery points it’ll do a whole lot more than just provide unparalleled vehicle protection. Whether you’re a 4WD enthusiast, a tradesman or just after some extra protection a TJM Bull Bar is what you’ve been looking for. • Integrated LED fog lights. • 8000Kg rated recovery points. • Provision for dual aerials.